Hanul nuclear power plant in South Korea is being developed in two phases. Alstom supplied the turbine generators and steam generators for the Hanul nuclear power plant units 1 and 2. Artist’s impression of Hanul units 5 and 6. Hanul (formerly Ulchin) nuclear power plant, the Hanul nuclear power plant is the largest nuclear power plant in South Korea. Located in Gyeongsangbuk-do province, the facility has an installed capacity of 6,157MW and is being developed in two phases. The first phase consisting of six units namely Ulchin 1-6 became operational in 2005, while the second phase consisting two units namely Shin-Hanul 1 and 2 is currently under construction. Hanul-1 comes with a three-loop pressurised light water reactor. The reactor in unit 1 has a net capacity of 945MW. Its construction began in January 1983 and was complete in September 1988. Hanul-2 is identical to unit 1 and its construction started in July 1983. It started operations in September 1989. Unit 2 consists of a 942MW reactor. The 912MW Tomari-3 became the 54th commercial nuclear plant in Japan when it commenced operations in December 2009. Hanul 3 consists of a two-loop light water pressurised water reactor, which became operational in August 1998. It is the first Korean Standard Nuclear Power (KSNP) Plant and has a 994MW reactor. Main features of the third unit are a safety depressurisation system, improved chemical and volume control systems, as well as digital control systems. The KSNP nuclear technology self-reliance programme was initiated to achieve self-sufficiency in electricity supply by achieving self-reliance in nuclear power related technology. Hanul 3 was the first plant to implement KSNP technology in 1998. The system includes a set of steps to be followed to generate electricity in a safe environment. Hanul 4 unit was constructed similarly to Hanul 3. A two-loop light water KSNP plant, unit 4 comes with a 998MW reactor. It has been operational since August 1998. Hanul 5 unit has a 1,001MW pressurised light water reactor. Construction on the unit began in January 1999 and connected to the grid in January 2004. The 996MW Hanul unit 6 was constructed between September 2000 and January 2005. Construction on the Shin-Hanul unit 1 started in July 2012. The unit will include APR-1400 pressurised water reactor. The reactors will cost an estimated $6bn, and the net capacity of the unit will be 1,340MW. The new unit is expected to start operations in2017. Work on the construction of Shin-Hanul unit 2 is expected to commence from September 2013 and finish in 2018. The unit will include APR-1400 pressurised water reactor with a net capacity of 1,340MW. Hanul Nuclear Power Plant units 1 and 2 comprise France CPI model reactors, with units 3-6 comprising OPR-1000 model pressurised water reactors. Being used in Shin-Hanul 1 and 2, the APR-1400 was initially known as Korean Next-Generation Reactor. It has an enhanced seismic design to withstand 300gal ground acceleration. The reactor thermal power upgrade was carried out for Hanul 1 and 2 in September 2002. This resulted in an increase of the electric output by 54MW, from 1,003MW to 1,057MW. Long-term assessment strategies were planned based on equipment reliability processes, in order to reduce plant maintenance costs and system management. The Hanul nuclear power plant includes safety equipment such as the safety injection system (SIS), the safety depressurisation system (SDS), the shutdown cooling system, emergency feed-water system, and containment spray system. "The reactor thermal power upgrade was carried out for Hanul 1 and 2 in September 2002." Doosan Heavy Industries & Construction was awarded the contract for the construction and development of Hanul units 1-6. Framatome provided the reactors for units 1 and 2, while Alstom supplied the turbine generators, steam generators and architectural engineering services. Korean Heavy Industries and Construction and Dong Ah Construction Company were responsible for the construction. Korean Heavy Industries and Construction (Hanjung) manufactured the reactor vessel, steam generators, turbine, generators and pressurisers for the Hanul 3-6 units. ABB-CE provided the reactor coolant pumps, main components of the reactor, design work, engineering services, plant protection and safety systems. Architect and engineering services were provided by Sargent & Lundy. A $200m contract was awarded to ABB for supplying nuclear reactor equipment to unit 5 and unit 6. 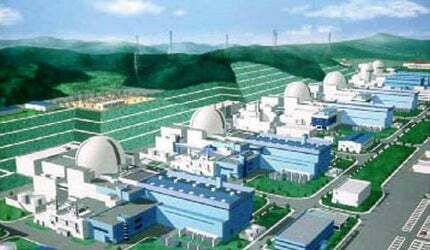 Doosan Heavy Industries & Construction was awarded the contract for manufacturing APR1400 reactors for the Shin-Hanul nuclear power plant units 1 and 2. Construction works were contracted to Hyundai Engineering and Construction, SK Engineering and Construction, and GS E&C Corporation through bidding process. Alstom will supply the emergency diesel generator (EDG) and generator circuit breaker.